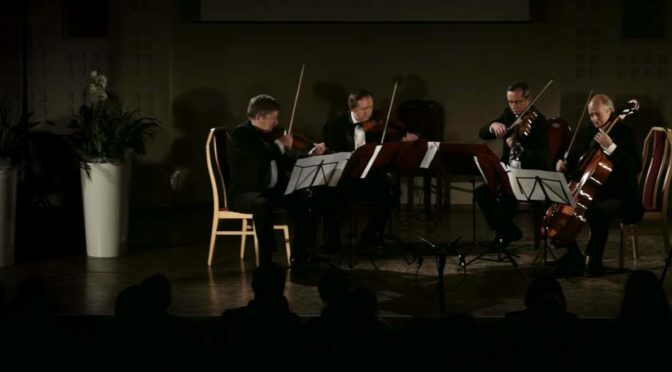 Camerata Quartet performs Polish guitarist and composer Gerard Drozd’s String Quartet, No. 3, Op. 155. From the 17th International Gliwice Guitar Festival. One of the beautiful pieces of contemporary music, enjoy! This composition was written for and dedicated to Camerata Quartet. Born in Gliwice, Poland, Gerard Drozd is a versatile composer and guitarist. As a composer has written more than 250 compositions for one or more guitars, for piano, voice etc… Among his works are four Concertos with orchestra, Concerto “Carpe Diem” for guitar and string quartet, Concerto for two guitars and string quartet, String quartets, 24 Preludes for guitar, 24 Preludes and Fugues for guitar, 24 Preludes for piano, 24 Preludes and Fugues for piano, Sonatas, Suites, Chamber music, Soli Deo Gloria for soprano and guitar and much more. His music has been played by very well-known artists in USA, Canada, Brazil, Mexico, Chile, Bolivia, Japan, China, Thailand, South Korea, Iran, Turkey, Morocco, England, Greece, Italy, Spain, Austria, France, Sweden, Denmark, Germany, Croatia, Montenegro, Belgium, Luxembourg, Czech Republic, Poland, Russia, Ukraine, Belorussia and elsewhere. His compositions Adagio op.44 and Triptych op.102 are on the CD “Hemispheres” by Lily Afshar, Yiddish Impression op.107 is on the CD “Puentes” by Marcelo de la Puebla, Dreams of a Clown on the CD “Suite enfantine” by Liat Cohen, Five studies op.88 on the CD “Dialogues” by Antonio De Innocentis, Adagio op. 44 on the CD “Guitar Recital” by Philip Hemmo, Berceuse op.56 on the CD “Premieres” by Hilary Field and Adagio op. 44 on the CD “In the beginning” by Zoran Dukic. Several of his compositions have been published in Italy, Germany, Switzerland, Canada, Belorussia and Poland. The composer refers to his harmonic language as a “kaleidoscopic”. His exquisite treatment of counterpoint and unexpected melodic elements are attractive features in his music. Music critics say that he has an attractive, intelligent, interesting, and very personal musical language. Gerard Drozd is both creator and artistic director of the International Gliwice Guitar Festival.